paddling vacation to the far corners of Florida. However, I have made a couple return trips to some of my favorite paddling destinations closer to me—one of them Loxahatchee River in Jupiter, Florida. This time, I brought along a good friend, Barb. We’ve had a rainy summer in Florida this year, and the rain started as Barb and I drove I-95 to get to the park. We vowed then to paddle rain or shine! Magically, the sun poked through by the time we arrived at the park, and the rain stayed away for the next few hours. All this South Florida rain did have its benefits, though, as the Riverbend trip is not always open at the park as it relies on the higher water level. What I like best about the Riverbend paddle (besides the beautiful scenery and safe location) is that the scenery changes every few minutes. 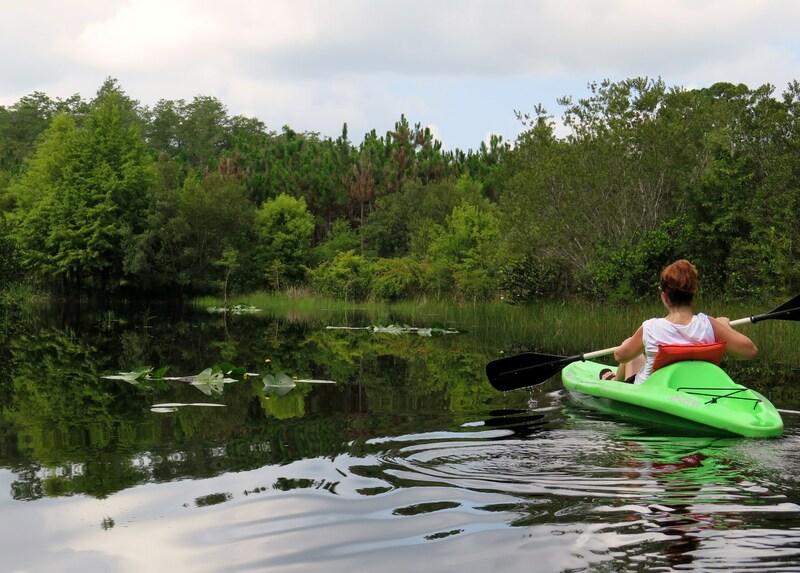 It’s a 5.5 mile paddle that begins and ends in the Loxahatchee River but travels through various sections of the park in between. It passes through fun-sounding places such as Picnic Loop, East Slough, Cow Pond, West Lake, Hunters Run and South Pond. Within the paddle are two portages—easy enough. Along the way, we spotted bikers, walkers, and even a painter! We stopped along West Lake for a stretch and a snack before moving on. I had looked forward to our paddle through the large culverts and the cypress knees, but dang if we made a wrong turn somewhere and ended our trip without passing through them! Even without the culverts and the knees, we had a great paddle and a fun day at Riverbend. We ended our outing with lunch at Guanabanas in Jupiter—what could be better? (Canoe Outfitters at Riverbend Park. 9060 W. Indiantown Road, Jupiter, FL 33478. (561) 746-7053).